Yesterday morning I had the absolute pleasure to get to teach Miss A how to quilt using my longarm. We started out with a practice piece that turned into a nice sized blanket for her American Doll. 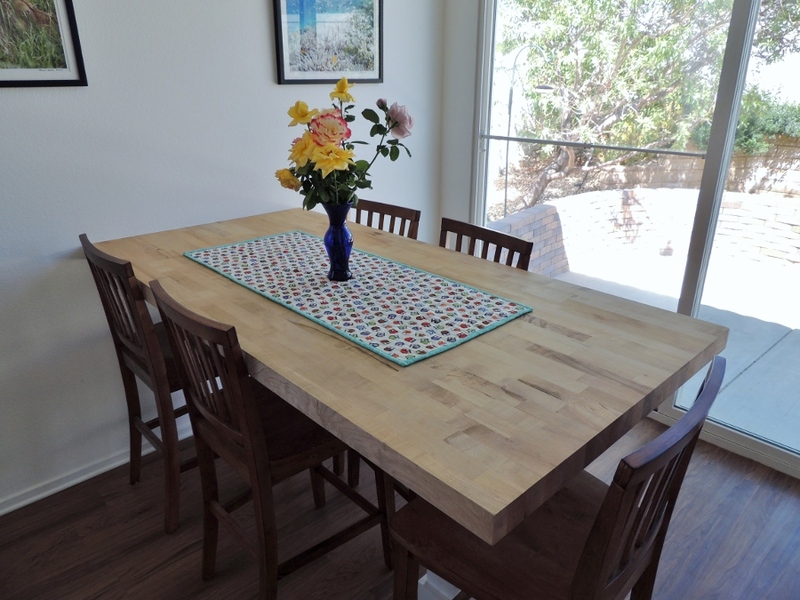 As you can see below, it would also make a great table runner! We talked about how to choose a quilting design and we practiced drawing swirls which are inspired by the print of the backing fabric. We had to play around a bit with finding the right sized stool for her to stand on to see the quilt. We started with something a bit too tall, and I didn’t like to see her so slumped and hunched over trying to see what she was doing, so we found a happier, lower stool to use. We ran my long arm with the stitch regulator turned on, which makes creating rounded shapes a bit more challenging, but that way she could stop at any time to take a rest and think about what and where to go next. I was very impressed with her test piece, and she was excited to jump right in and start quilting her quilt! 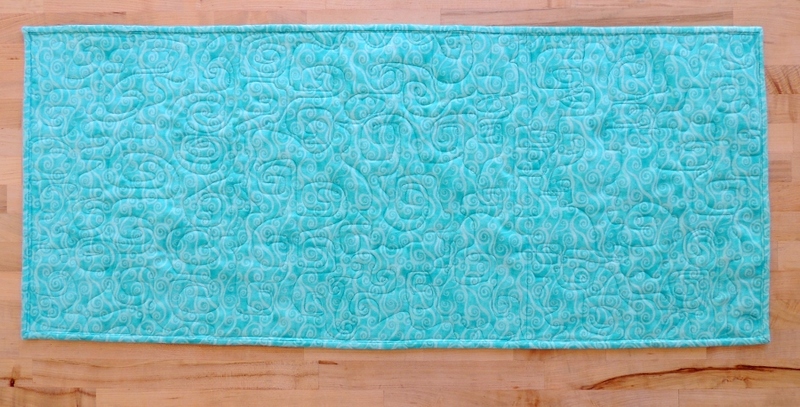 To begin, she started with the swirl and wavy line patterns that she practiced on the mini blanket. However, she started to think about each individual block and created custom designs for each block. It was awesome to watch her creativity and progression. She was a natural! It was a lot of fun to just quietly watch her play and explore with the machine. The lighthouse block was a favorite. She thought about what shingles might look like and quilted that along the top of the lighthouse roof. 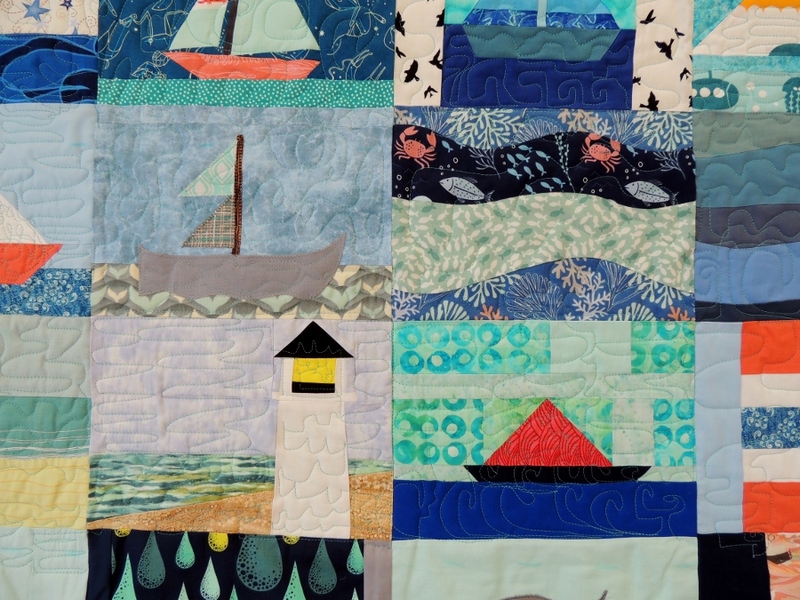 She also started varying the quilting pattern between the water / sky / sailboats and really enjoyed looking at the back of the quilt to be able to see the block detail because of the change of quilting patterns. I was a bit nervous about how my machine would behave, but it all went very smoothly. Miss A was able to complete about 40% of the quilting on her quilt along with making the mini blanket. On Thursday afternoon, Mr. L will get a chance to practice and get started on his quilt. She did a fabulous job! I’m super impressed by her skill and ability to create custom designs for each block. 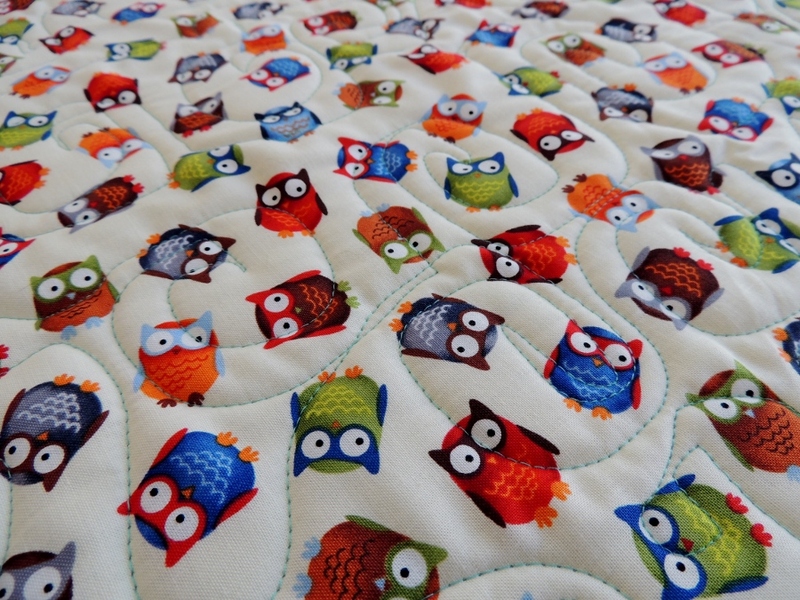 I believe you have created a little quilter! Fantastic progress! She did a fabulous job on her test piece. How neat to watch her dive in and try things on her quilt. I can only imagine the pride both of you felt. that is really brilliant! Well done to little Miss A, love what you guys accomplished together! That’s a lot done and done well! Beautiful work, Miss A! Oh my goodness, she did such a great job! Now I want to come and visit and have you teach me. I really want to learn to longarm someday, just not sure I could ever figure out where to put one if I could afford to buy one. Miss A definitely is a natural – what amazing work she did on her first time long arming. 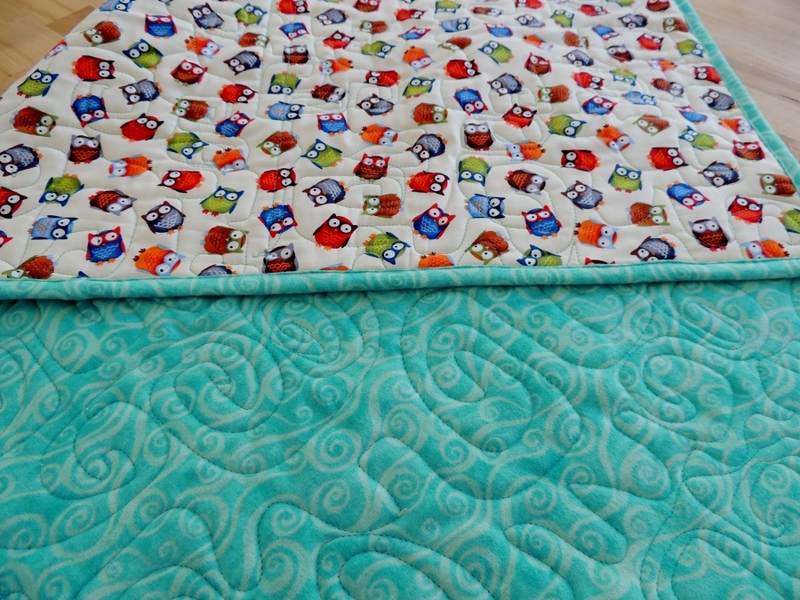 I love seeing how she has quilted her quilt: it is wonderful! You are a terrific teacher Yvonne! What a great time the two of you had together! What a fun time! I love how she started to think through each block design! 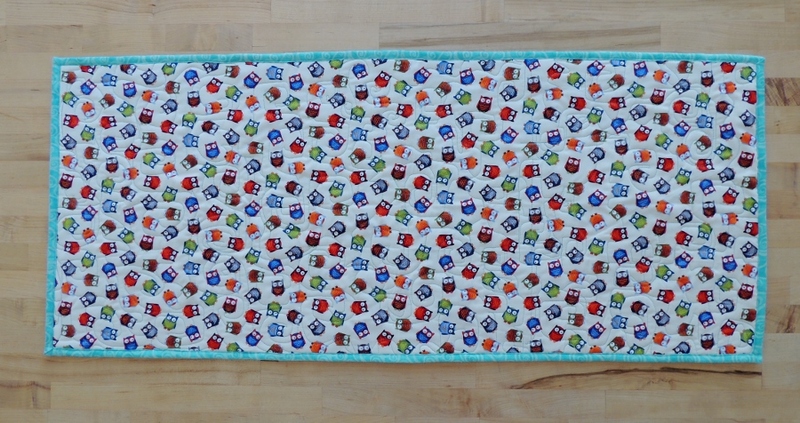 A little quilter in the making! What a wonderful experience. You have really good teaching skills. I’ll bet it was amazing watching her create and experiment with the space in between. Sounds like an awesome day!! Your pride in Miss A and your generosity in teaching her to quilt really come through in your blog post. Must be very satisfying for you as well as a good feeling for giving back. Miss A did a wonderful job. To be young and unafraid to try, just let your creative side shine. WTG Miss A!! How lovely to approach quilting with a child’s enthusiasm, sense of discovery and delight! I’d be all tense and anxious about doing it ‘wrong’, spoiling the quilt or damaging the machine! Sounds like it was a great approach for teaching quilting. Her quilting is so beautiful and I’m sure the quilt means a lot to her. You are a great teacher. She’s doing an amazing job! I love the confidence you’ve instilled in them to jump in and explore different quilting techniques–thing some adults take years to venture into. We adults can learn a lot from Miss A! She just jumped right in there while others of us (ahem, me) get stymied thinking we won’t do a good enough job. 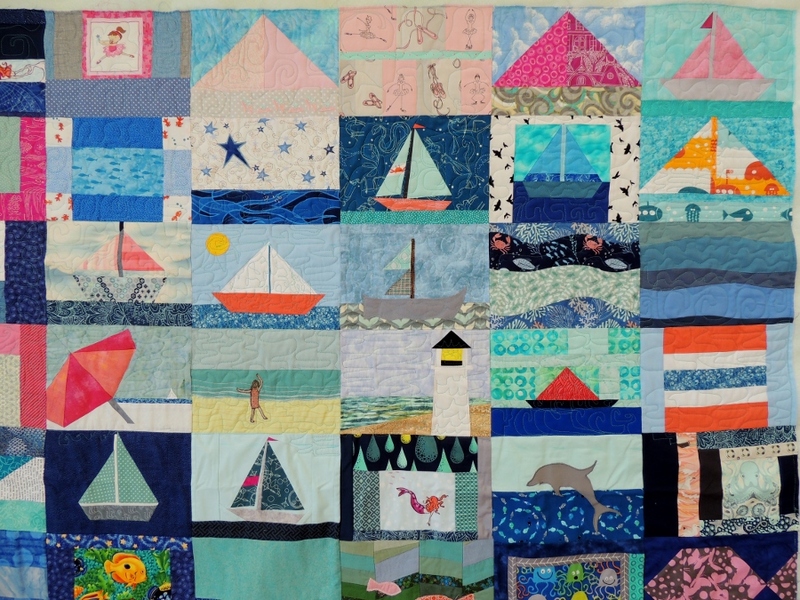 That’s why I love children’s art–and her quilting in particular. What a wonderful experience for the two of you to share! Awesome. The quilting is great. I think she does better work than me. Good luck with Mr. L.
Miss A did a wonderful job with her quilting! How splendid that you are teaching them. Thank you for sharing and have a wonderful creative day! 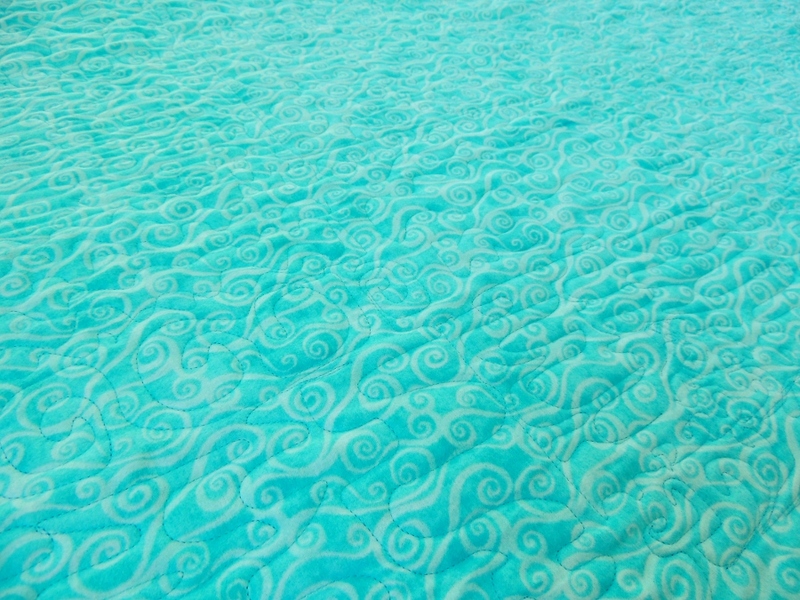 Wow, her quilting looks amazing, she’s a natural! Perhaps as well as creating a quilt for life, you have created a quilter for life too? I love her quilt, it is so happy and fun! Curves are hard, but she did an amazing job! I love her fearless approach to custom quilting! Each time I see this, I notice another block to admire in detail. This time, I am smitten with the girl dancing on the beach.